A number of years ago, I decided it would be fun to participate in some of the 5K runs that were becoming so popular. Many were being used as a way to raise funds for charitable organizations and some to get more people active and into running. It seems like the more fun they could add to the experience, the more likely they were to get a lot of runners. Making the 5K run’s fun worked. It attracted a lot of us and they still do. 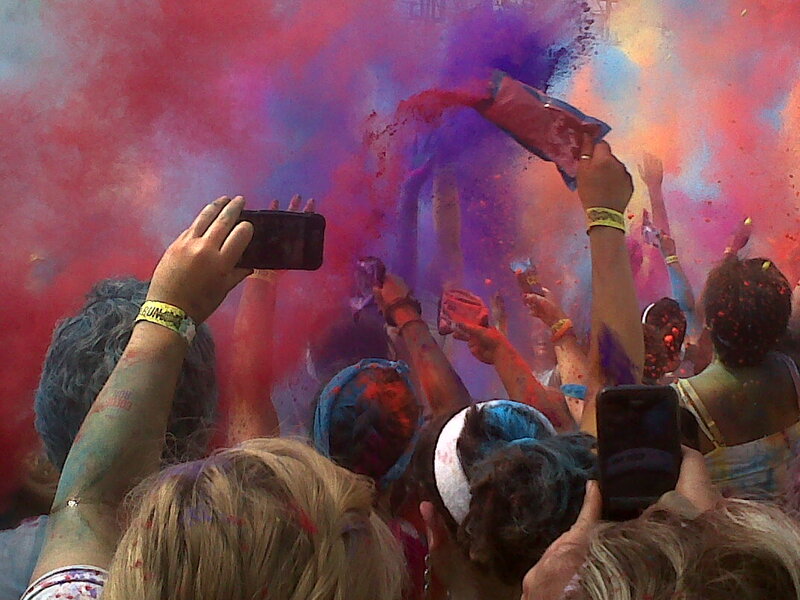 I have done a number of Color runs, where you show up for the 5K in all white and by the end you look like a rainbow. The course has various color stations that you run through. As you run through the color station, a powdery shower of yellow, purple, green or blue is sprayed at you by the volunteers, creating a multitude of colors on your clothes and also covering your hair by the end. The colors are safe or so they say. Good thing too because you feel like you are breathing them during the run through the color stations, and after the color run you are sneezing colors and wiping colors out of every part of your body—yes every part, even those parts. These runs were a good way to connect to other women including family. My daughter Sara got me involved in the Color runs, and she invited her friend Megan and my sister Kathy and I, to a run at night, called the Glow run. The Glow run was really fun because it was at night and we had to make matching shirts with glow in the dark paint, and we wore glow in the dark jewelry and glasses. Getting ready for this run was half the fun. 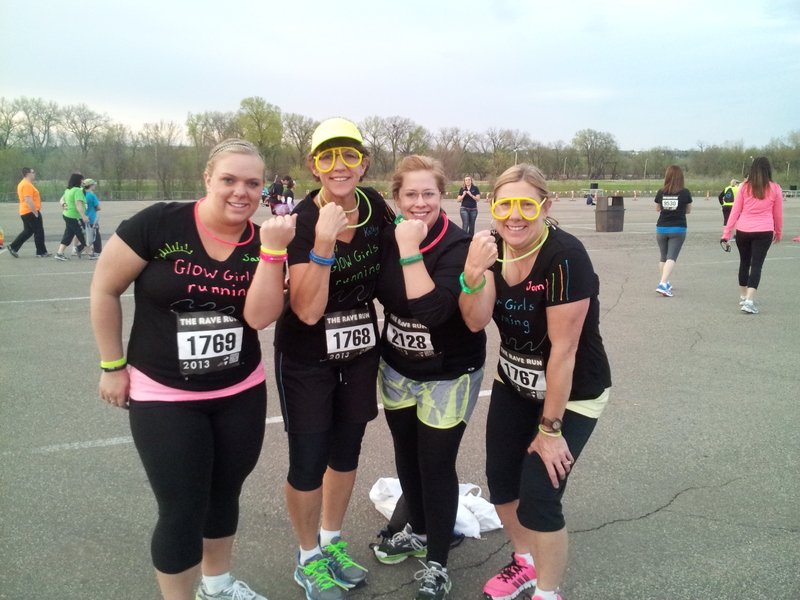 It was held at Valley Fair, so the amusement park atmosphere fit the glow run craziness. During the run we had to be extra careful not to step in a hole or trip in the dark, which added to the fun, but also made it the slowest run ever. 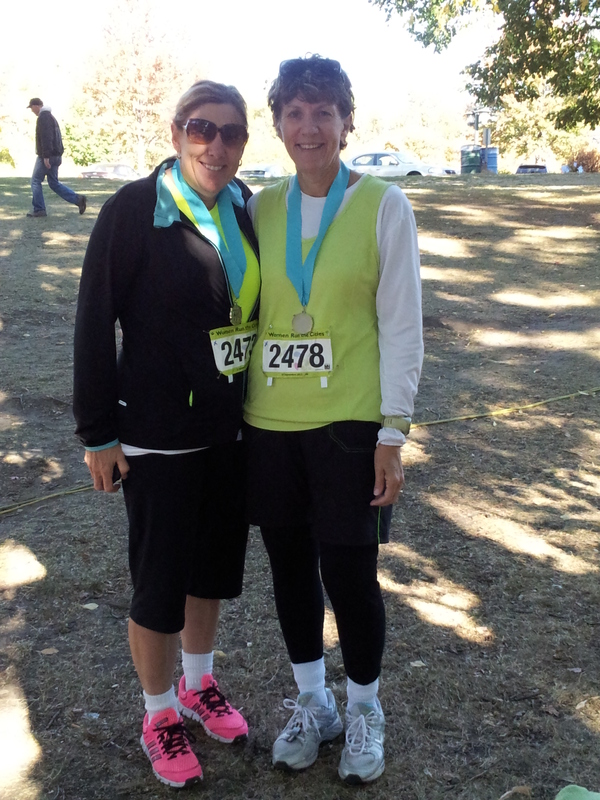 We got through the run without any injuries and had a great time. There were hundreds of runners and they had all kinds of colorful moving lights throughout the trail that added to the nighttime mystique. 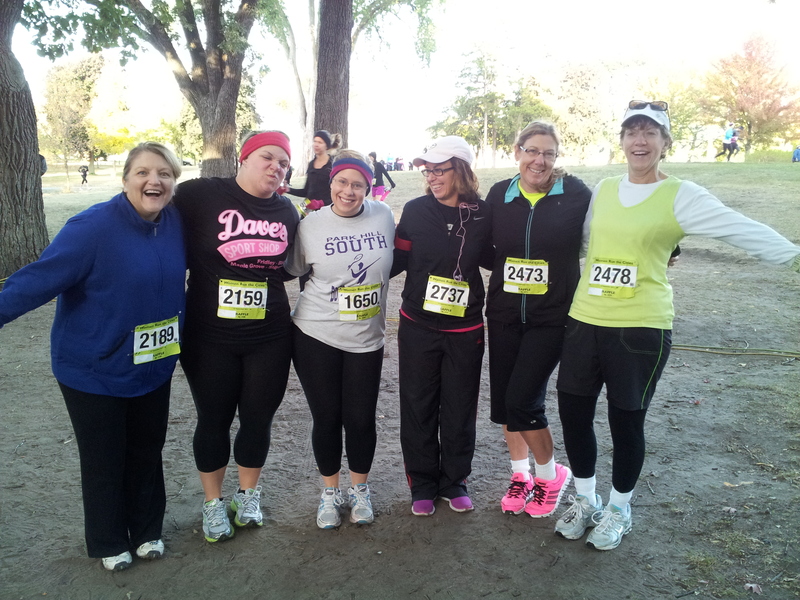 I also invited my sister Kathy, and Sara and Megan to a charity run called Women Run the Cities. It was sponsored by a great organization I belong to called MNCREW, and the beneficiary of Women Run the cities was a charity for at risk young girls. The charity was started by Ann Bancroft, the Arctic and Antarctic explorer and author. Ann has been one of those amazing women that has succeeded in her own quests to explore and educate, and has worked so hard to make opportunities for other women and girls. We did this run many times and we did get to meet her and it was not disappointing. She was as gracious, energetic and down to earth as she seemed when we had seen her speak on prior occasions and on TV. My daughter Sara, Megan and I signed up for one of the most fun runs in all the Twin Cities called the Anoka Halloween fun run. 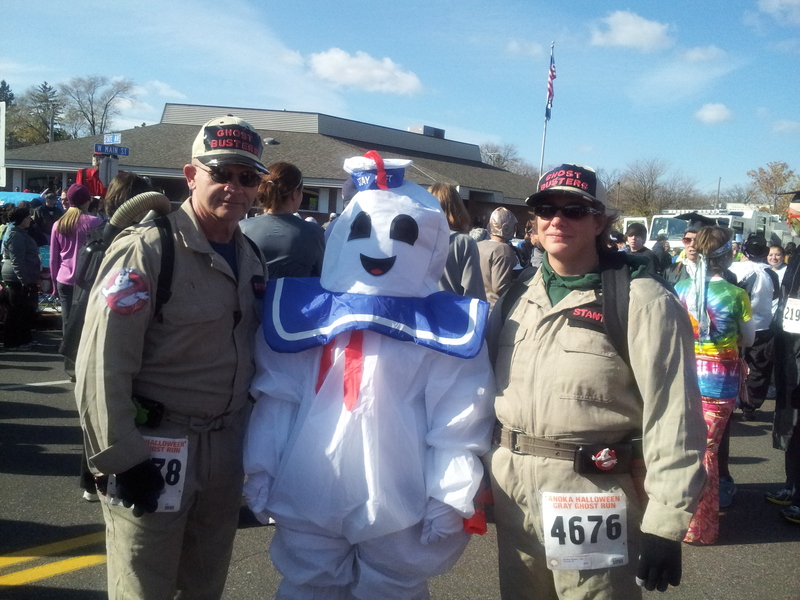 This is a 5K that you run in a Halloween costume. We learned quickly to pick your costume carefully. Anoka is known as the Halloween Capital of the world, and those Anoka residents take their Halloween very seriously. The costumes people were running in were amazing. One group of people were actually pushing a large, fifteen foot homemade Paul Bunyan and Babe the blue Ox. It took a group of eight people in lumberjack shirts to pull that off and rightly so, they won the costume contest. 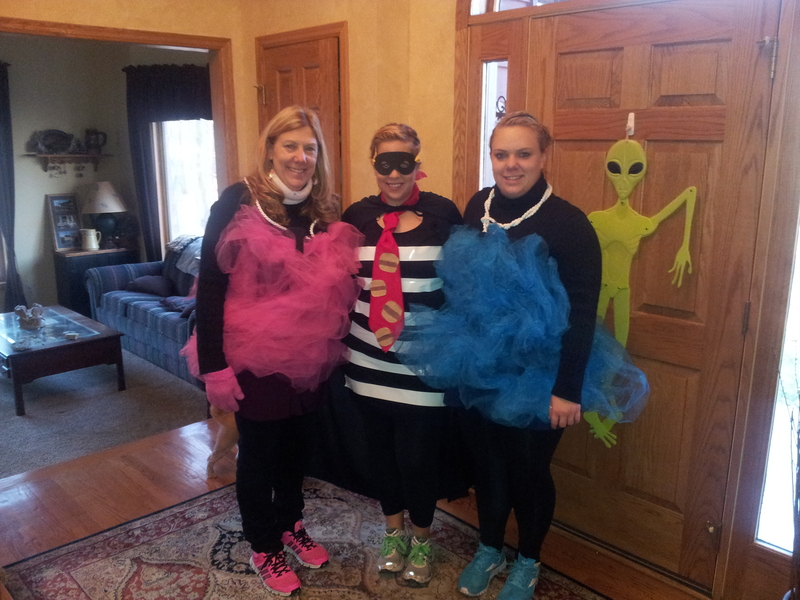 Sara and I dressed like luffas and Megan dressed like the Hamburgler, which were all fairly easy to run in. Luckily no one takes their running times very seriously at these runs. Serious runners and competitive people probably do not spend a lot of time on these fun runs. Many of us are talking the whole time, laughing and tripping over our own feet. What I have discovered is that these runs are more than a good time with the girls, my friends, daughter and sister. It is a bonding experience that starts with the calls and texts to each other, convincing each other to join the run and getting the group together. The next bonding experience is getting ready for the run, whether that is the fun of shopping to find a costume to be able to run in or all white clothes or glow in the dark items to wear at night. The texts and calls fly back and forth and the bonding continues. My daughter Sara has been a real instigator in finding some of these fun experiences, and my sister, who is normally a competitive runner and one with impressive times for her normal 5K’s, has been such a good sport in joining us for these fun runs, even though she has to drive from the South Dakota border to get here. The runs provide some exercise, but they are so much more. They provide a fun, noncompetitive activity that is not the cliché shopping. Running with the girls helps us appreciate the fun things in life, helps drop away our little worries of the day, puts the stress of work or home on hold and provides a connection with some of the best women in our lives. A run that is really no run at all, but provides an outlet to share a laugh and a hug and a little sweat, and rub off some love and sometimes color on each other. Run with your girls and appreciate the sometimes very simple pleasures in life. Housework, homework and work obligations can wait. Run with the girls!